For all the troubles in her past life, sweet Chicklet seems to bear no ill will and she prefers to focus her energy on whatever good things her future holds--and things can only get better. She has been bred relentlessly and without regard to her health. Chicklet had surgery to remove multiple mammary tumors, all of which were benign. 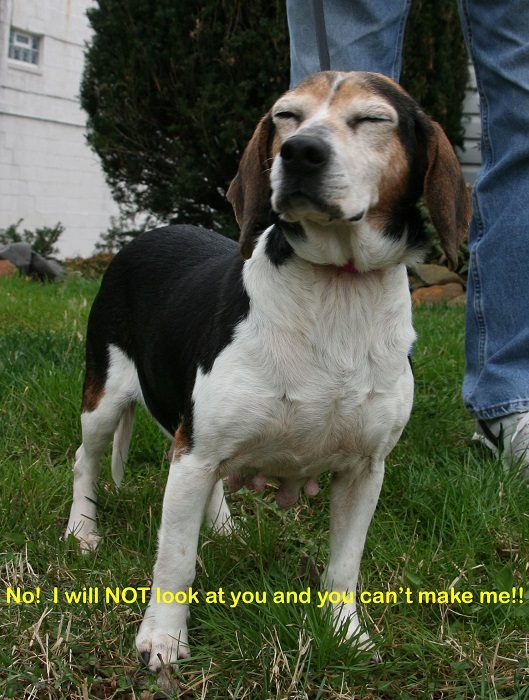 She also suffered from heartworm, anaplasmosis, lymes, and ehrlichia. As an added bonus, after her owner had made all the money off of her that he could, she was dumped at the shelter. That's all in the past now! Things are looking up! Chicky loves being outside in the sunshine. She's got a good grasp of house-training and she's learning some commands , like "Down" and "No." Due to the loving diligence of her foster mom, Chicklet is making great progress. She likes to play with a few stuffed toys and chew on a bone or antler once in a while. She is friendly towards everyone she meets, including children. 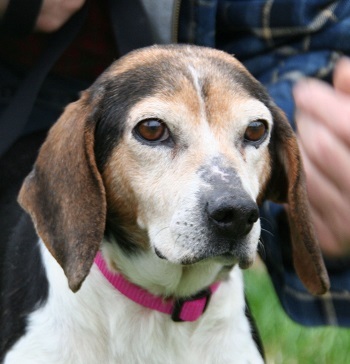 Chicky loves attention and really enjoys gentle belly rubs and petting and snuggles. She seems to be learning from my the other resident beagles. It may be a couple of months until she is free from Heartworm disease. Once she has had her various ills addressed, she'll be feeling better and can begin interviewing for her forever home.